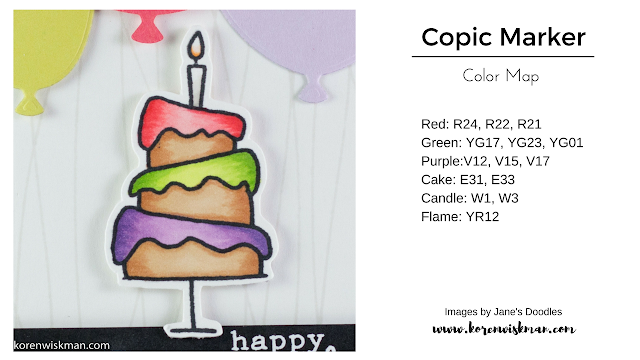 Today I am sharing with you a card I made for my crafty friend Kaja! You can find her YouTube channel (CLICK HERE!). You can also find her on Instagram at Kajayika.crafts. She is a fantastically kind and creative person and if you don't already know of her, please, go visit her and see all the fabulous cards she creates. Kaja sent me a birthday present earlier this year around my birthday and I haven't made time to play with it until this morning. So, I couldn't sleep and I got up out of bed and came here to my craft room and started creating. 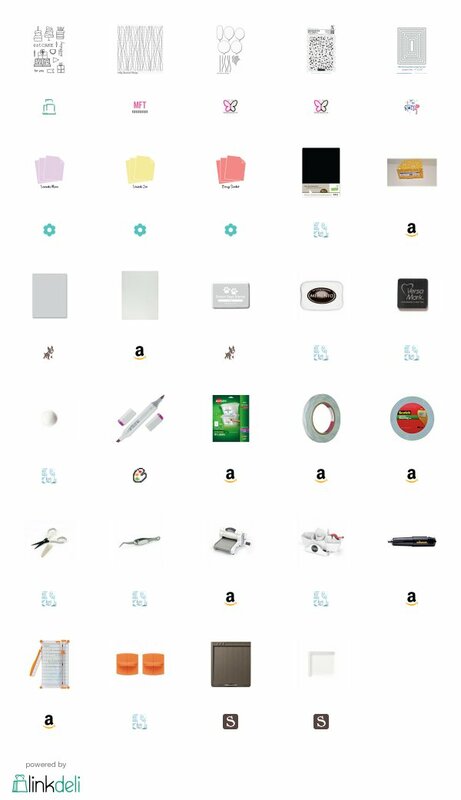 Luckily, I had just ordered some "birthday" type supplies from Butterfly Reflections Ink. So, I was itching to play with my new toys. 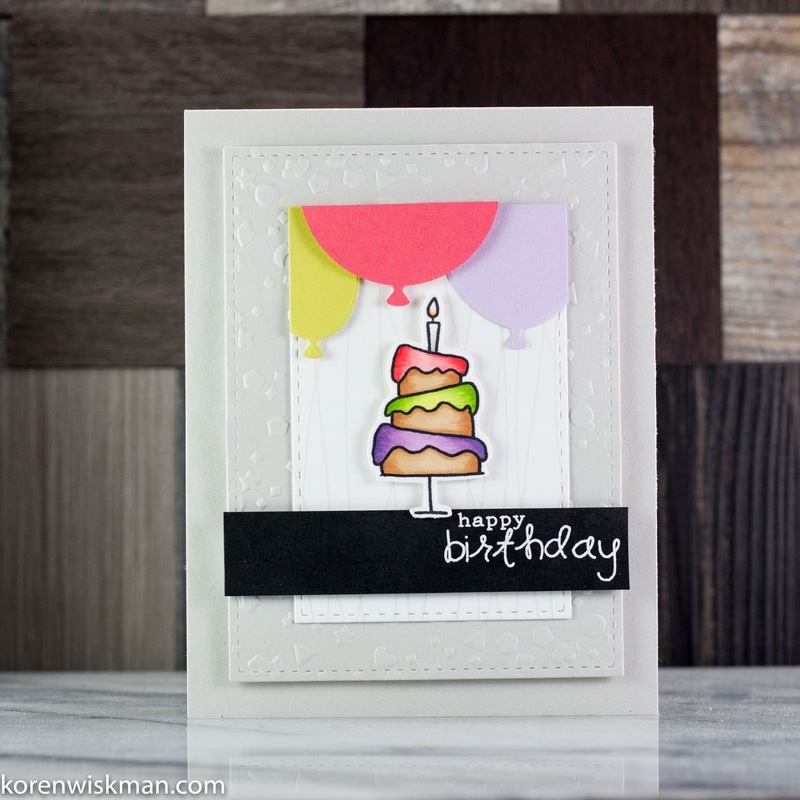 I started with a piece of Simon Says Stamp Fog cardstock. 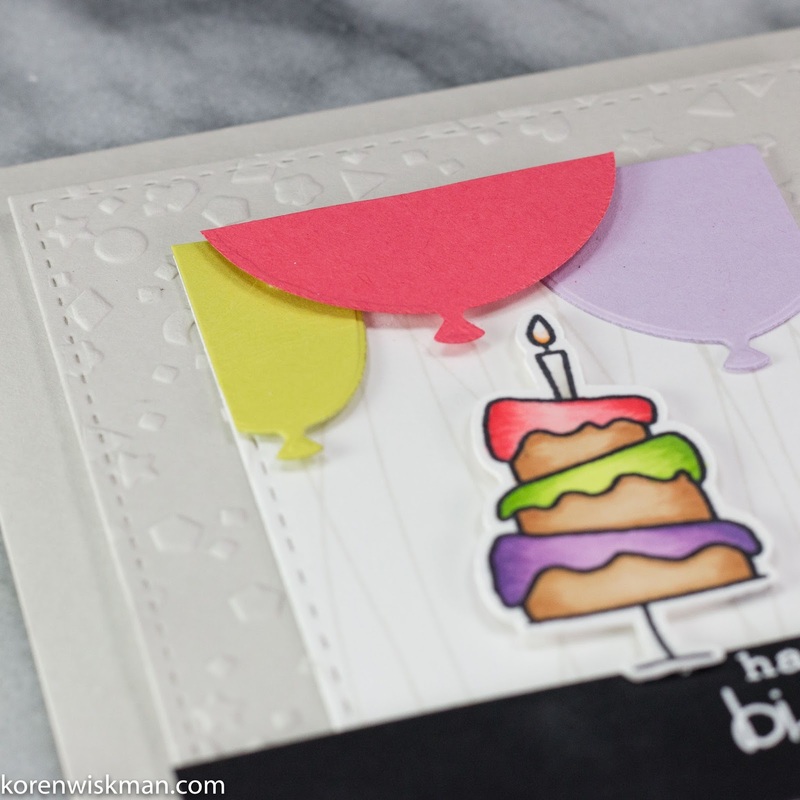 I used the Docrafts, Mixed Confetti embossing folder to emboss the background of my card. I cut it down using the Your Next Stamp Stitched Rectangle die set, second to largest. I popped that onto my top folding A2 sized card base made from Simon Says Stamp Fog cardstock. I used a piece of craft foam and some 1/2 inch double sided tape to adhere it to the card base. I took a piece of Neenah 110 lb cardstock and the MFT ballon strings background stamp and stamped it with Simon Says Stamp Fog Ink. I cut this piece down with one of the smaller rectangles from the YNS Stitched Rectangle die set. I used the MFT Big Birthday Ballons Di-namics to cut out some balloons to go across the top of my front panel. I used Papertrey ink Limeaide Ice, and Berry Sorbet, as well as, Avery Elle (purple cardstock that isn't sold anymore). I adhered them with a series of double sided tape and scotch 3M foam tape to add dimension. I chose the wonky cake image from the Party Time stamp set by Jane's Doodles. I love this set. I will cherish this set forever! I stamped it in Memento Tuxedo Black ink on Neenah 110 lb cardstock and colored it with my Copic Markers. 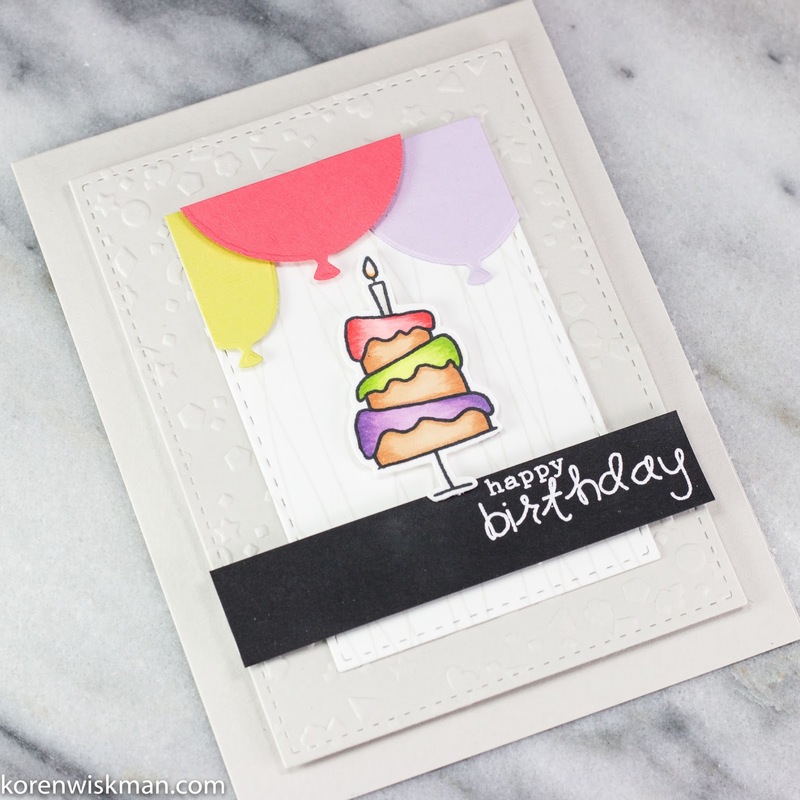 I also stamped the "happy birthday" sentiment on Lawn Fawn Black Licorice cardstock with Versamark ink and white heat embossed it with Hero Arts Ultra Fine white embossing powder. I cut the sentiment into a strip and popped both the image and the sentiment up with foam tape.